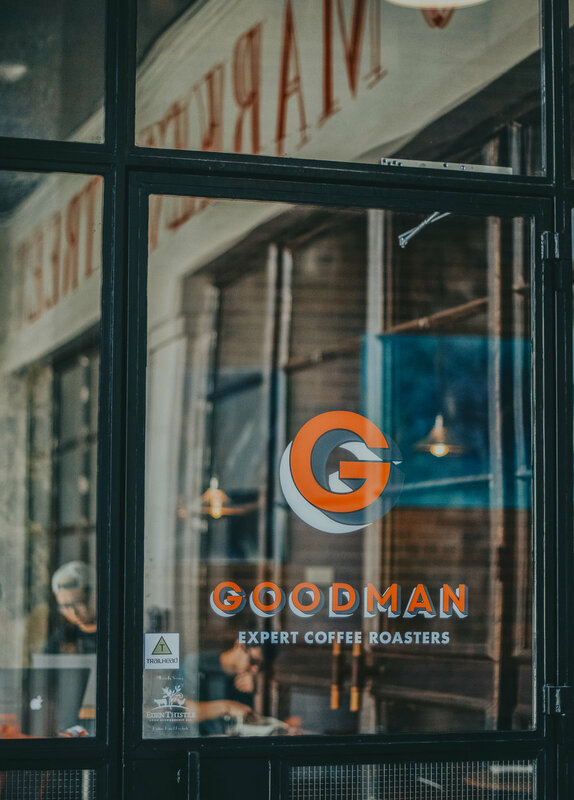 Goodman Coffee is a small batch coffee roastery with a neighborhood café located in the heart of downtown Chattanooga, Tennessee. We are conveniently located on the ground floor of Warehouse Row, close to your favorite shops and downtown offices. Our café has a warm and inviting atmosphere, along with a French bistro-style patio—the perfect spot to sit with a friend or your phone. .75 for an extra shot of get-up. Goodman Coffee is committed to producing only the freshest, highest quality coffee. We regard our wholesale customers as partners providing opportunities to share our passion with more people. We focus on consistency at every step of the way. To us, coffee is more than just great beans—it's about building community. If you own a restaurant or other customer service-centered business, we'd love to talk to you about working together. Drop us a note and let us know how we can help you! Follow the aroma of freshly brewed coffee, or type 1110 Market Street, Chattanooga, Tennessee, into your maps app of choice. If you live or work downtown, take a stroll and come visit us. Bring the doggo too and enjoy our patio. We’ve got prime bike parking for a quick stop on your commute. Don't forget your lock! Take advantage of the Warehouse Row parking garage. Just be sure to bring your ticket in and we’ll validate it. We'll also validate you with compliments. Did you know Chattanooga has a free electric shuttle? Hop on then hop off at the Warehouse Row stop and you’ll be steps away from our storefront.